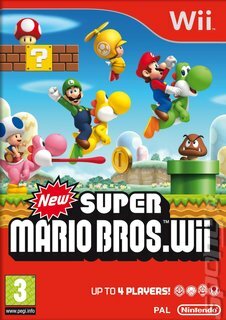 The spiritual sequel to the hugely popular New Super Mario Bros. DS, New Super Mario Bros. Wii features classic 2D Mario game-play with 3D, pre-rendered characters and lovely, highly detailed backgrounds. The premise will be fairly familiar to anyone who's played a Mario game before - Princess Peach has been snatched away by Bowser and its down to Mario to save her. This time, however, he won't be doing it all on his lonesome. The big deal this time around though is the inclusion of four-player play. We don't say co-op or competitive play because adding extra players to a Mario game doesnt necessarily lead to team work or combat. Instead Nintendo has tried to balance the game so that in some parts you feel compelled to help each other and in some you will want to fight over certain items and prizes. 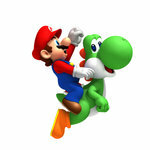 Its a very dynamic experience, enabling players to take on the role of Mario, Luigi or one of the Toads. New goodies to be grabbed in the game include a propeller suit that enables you to fly and hover, picking up a fellow player if you feel like it, and a new penguin suit that will let you fling ice balls at enemies or slide around on your belly at high speeds across stretches of ice! 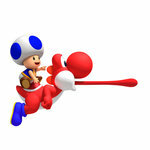 New Super Mario Bros. Wii is also the first game to feature what Nintendo is calling the 'dynamic help system'. If players are finding the going a bit tough, they can hand over to the AI at any point, watching how a level is done then jumping back into the fray at any point!